TEMPLE Bar is a “disgrace to Ireland,” is covered in vomit and is a scene of constant brawling, a judge has told Dublin District Court. Judge Anthony Halpin made the comments during a case in which an IT worker was accused of brawling with another man after a game of football. He dismissed the case against dad-of-two Addezine Baho, describing it as self-defence, and remarked that not one member of the public stepped in to help. Mr Baho (33), of Castlelands, Balbriggan, denied using unlawful violence outside the Czech Inn on Temple Bar. Finding him not guilty, Judge Halpin said the other man, who has since admitted assaulting Mr Baho, was the “motivating person in this thuggery”. He noted that, although pub security did their best to defuse the situation, bystanders were seen “shadow boxing” rather than coming to Mr Baho’s aid. “I think it’s nothing short of a disgrace,” said the judge. 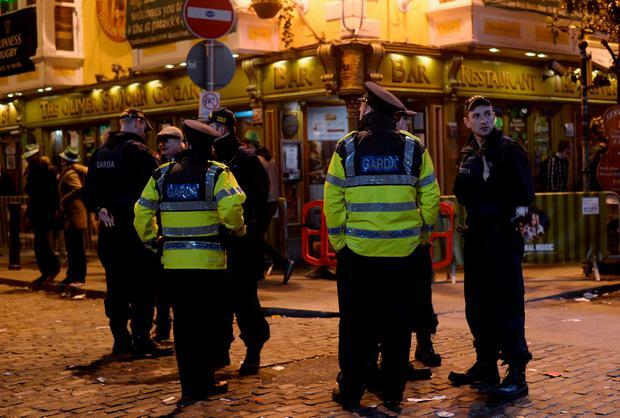 “Temple Bar is a disgrace to Ireland. “You go up there first thing in the morning over any weekend and you see vomit and puke. Garda Kevin Meaney said the incident happened at 4am on May 21, last year. Mr Baho and the other man were restrained by security after an altercation on the street Mr Baho, who had been punched in the face, was seen kicking the other man on the ground. It was “an extremely violent situation,” Gda Meaney told the court. He said he felt that the accused brought the violence to another level by kicking the other man while he was on the ground. Although the man sustained a broken nose, Mr Baho was not charged with assault. Viewing CCTV footage, Judge Halpin said the other man crossed to the opposite side of the road, had no top on and was seen “moving back into the arena for a full-scale fight”. Mr Baho said that after the football game, he tried to avoid the other man who began saying “the Irish stink”. When Mr Baho went outside for a cigarette, the other man followed him. Mr Baho said the man grabbed him by the neck and told him that he would kill him. Mr Baho told the court that he was terrified. Tony Collier, defending, said Mr Baho “didn’t start this” and any violence he engaged in was self-defence. Czech Inn door supervisor Cillian McNamara said security separated the two men twice. He said he saw a “look of horror” on Mr Baho’s face when the other man attacked. A State solicitor argued that Mr Baho “could have walked away”.